In Namibia all appliances run on 220/240 volts. Electrical outlets are of the round 3 pin – 15 amp type (Type M). 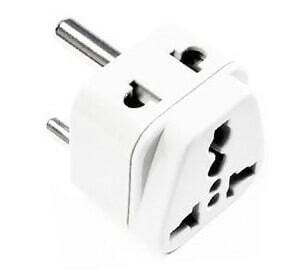 If you are traveling from abroad you will need an adapter (better yet bring 2 of them) to be able to charge your camera, cell phone, laptop, etc. Your adapter for small electrical appliances or chargers requires a conversion plug to a three-pin type outlet which is found in Namibia. See image below. The best adapter that you can get for traveling in Namibia is a power adapter. This enables devices from all over the world to be plugged in safely and get charged. Remember that many of the lodges and guest farms in Namibia are located in remote areas and often use generators for power. These are often turned off at some stage in the evenings so don’t expect to charge your devices in the evening.